A man in his early 20s has died after being stabbed in east London. The Metropolitan Police said the wounded victim approached officers in Link Street, Hackney, just before 20:00 BST on Wednesday. He was given first aid by the officers but died at the scene about 25 minutes later. Less than two miles away, a man in his 50s was pronounced dead at a bookmakers in Upper Clapton Road following reports of an assault. The deaths come following two fatal shootings on Monday. Sixteen-year-old Amaan Shakoor, from Leyton, was left critically ill and died on Tuesday after he was shot in the face in Walthamstow. A 15-year-old boy was also stabbed in the same incident but survived. The London Ambulance Service and London's Air Ambulance also attended the stabbing in Hackney. The victim's next of kin are yet to be informed and a post-mortem examination will be held in due course. 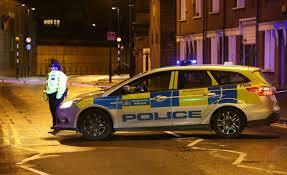 Four hours earlier, police were called to a bookmarkers on Upper Clapton Road following reports of an unconscious man. The Met said: "Despite the efforts of medical staff the male, believed to be aged in his 50s, was pronounced dead at the scene. Officers are working to inform next of kin. "The victim is believed to have been involved in an altercation with another male who has since left the scene." The Mayor of Hackney, Philip Glanville tweeted that two lives had been "cut short by violence". London's Deputy Mayor for Policing and Crime Sophie Linden said City Hall was "prioritising tackling this violence". "We're not pretending there isn't a problem in London but we will get on top of it," she said.